who else is already knee deep in pumpkin baked goods? 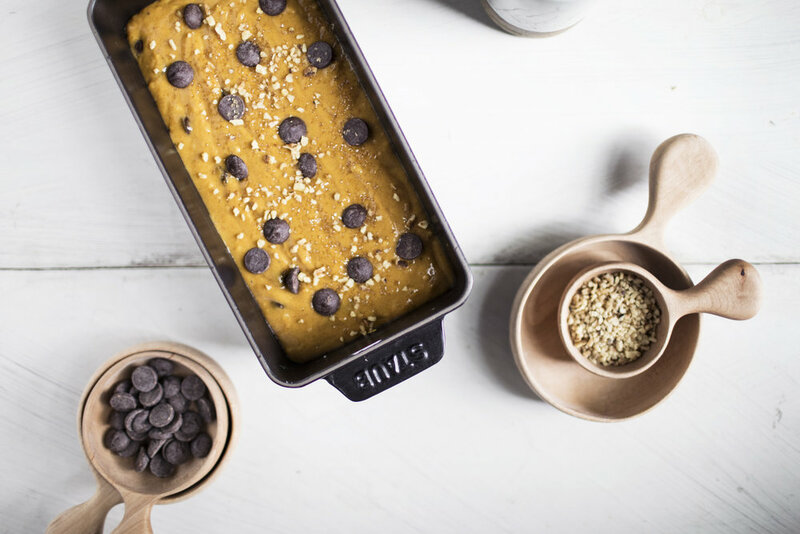 while i love using it in just about everything i can possibly think of, a classic pumpkin loaf will always be my favourite way to consume pumpkin. yes, even more then actual pumpkin pie! growing up my aunt made the best pumpkin bread in the world, literally. it was dense, moist & the perfect amount of sweetness. 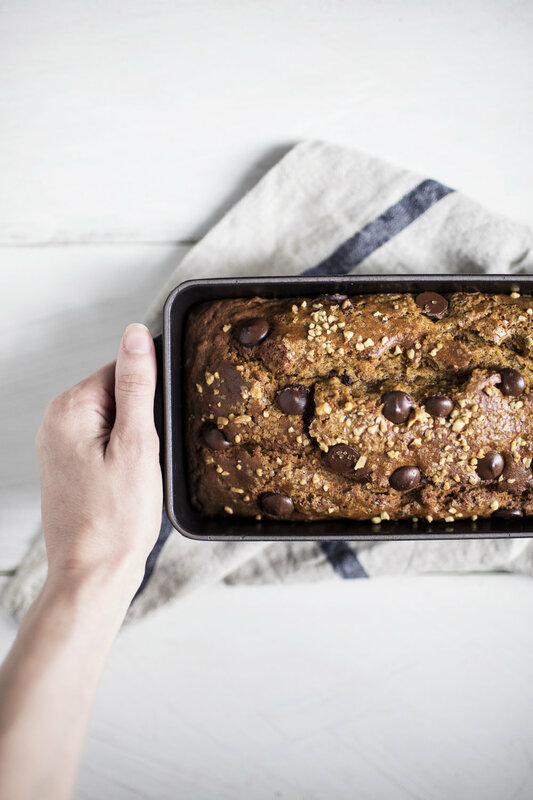 today i bring you a healthy-ish version of pumpkin bread! 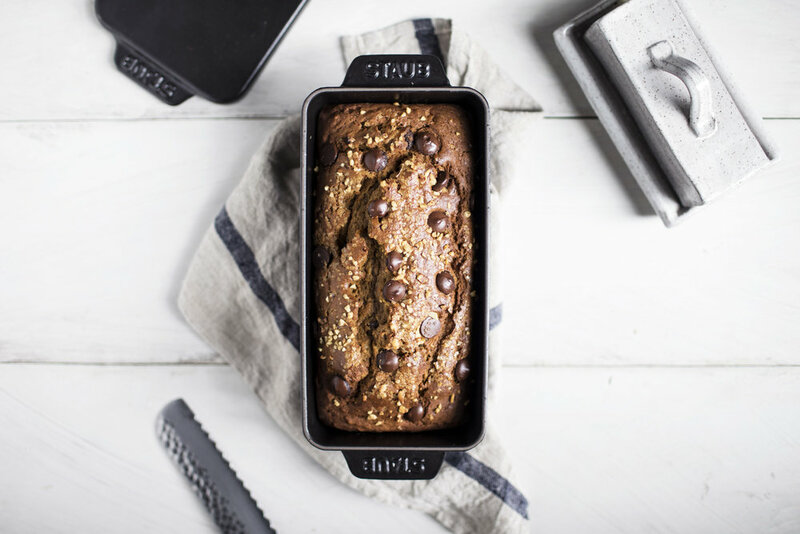 it is made with extra virgin olive oil, dark chocolate & bob's red mill %100 stone ground whole wheat flour. this means you can eat it for breakfast, lunch or dessert! the olive oil adds a nice underlaying flavour, but it is important to use extra virgin olive oil rather then regular olive oil. the whole wheat flour also adds a nice wholesome texture to the final product. while this recipe produces the perfect size loaf, it works great as muffins too. just follow the same directions, but divide amongst 12 lined muffin tins & bake for 20-25 minutes. in a large mixing bowl sift together the flours, salt, baking soda, ginger, cinnamon & nutmeg. set aside. 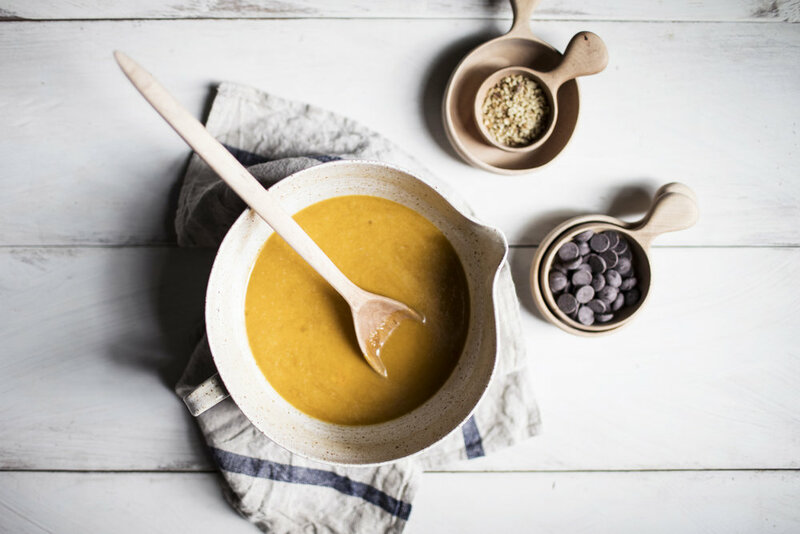 in a separate large mixing bowl whisk together the pumpkin puree, sugar, olive oil, eggs, vanilla & whole milk until well combined. slowy add in the flour mixture & stir until batter comes together. do not over mix, a few lumps are okay. fold in the chocolate chips & walnuts. transfer to a greased loaf pan. bake for 45-50 minutes, or until the top bounces back to touch. let cool to room temperature before removing from pan & serving. this post was created in partnership with bob’s redmill!